Digital Image Map of Rhea. A beautiful 1988 digital image map of Rhea, the second largest moon of the planet Saturn issued by the U.S. Geological Survey. It depicts the surface of the satellite based on images from Voyager 1 and 2. The North Polar Region and the South Polar Region are represented in two insets in the upper left and right quadrants respectively. The primary mission of the Voyager 1 and 2 at the time of launch was to explore Jupiter and Saturn. Since then, the mission objective has been extended to exploring the Solar System beyond the outer planets, as far as the Sun's sphere of influence and possibly even beyond the outer limits of our Solar System. Voyager 2, launched in August 1977, flew by Jupiter and Saturn and continued on to explore Uranus and Neptune, becoming the only spacecraft to visit these outer planets. It is also the only spacecraft to have studied all four giant planets of our Solar System at close range. Voyager 1, launched in September 1977, also flew by Jupiter and Saturn and continued on toward interstellar space. Both space crafts are carrying a golden record explaining their origins and containing sounds and images portraying Earths life and its culture in all its diversity. Although departing the Solar System in different directions, both Voyagers have reached the Heliosheath, where the solar wind mixes with interstellar wind. 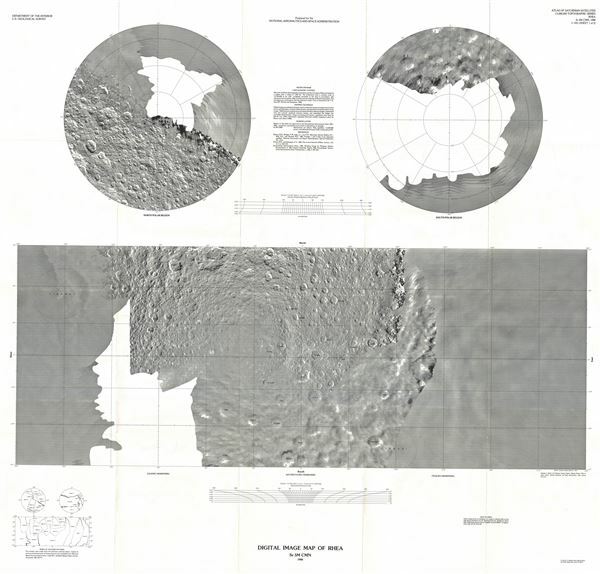 This map was prepared for the National Aeronautics and Space Administration and published by the U.S. Geological Survey as Atlas of Saturnian Satellites Topographic Series Sr 5M CMN map I-1921 sheet 1. Miscellaneous Investigations Series. Department of the Interior. United States Geological Survey. Very good. Original fold lines visible. Blank on verso.